Ludwig Wilhelm Erhard (German: [ˈluːtvɪç ˈʔeːɐ̯haʁt]; 4 February 1897 – 5 May 1977) was a German politician affiliated with the CDU and the second Chancellor of the Federal Republic of Germany (West Germany) from 1963 until 1966. He is often famed for leading German postwar economic reforms and economic recovery ("Wirtschaftswunder," German for "economic miracle") in his role as Minister of Economic Affairs under Chancellor Konrad Adenauer from 1949 to 1963. During that period he promoted the concept of the social market economy (soziale Marktwirtschaft), on which Germany's economic policy in the 21st century continues to be based. In his tenure as chancellor, however, Erhard failed to win confidence in his handling of a budget deficit and his direction of foreign policy, and his popularity waned. He resigned his chancellorship on 1 December 1966. Born in Fürth, Kingdom of Bavaria, Erhard was a commercial apprentice from 1913 to 1916. After his apprenticeship he worked as retail salesman in his father's draper's shop. In 1916, during World War I, he joined the German forces as an artilleryman. He fought in Romania and was seriously injured near Ypres in 1918. Because of his injury he could no longer work as a draper and started learning economics. He received his Ph.D. from the University of Frankfurt in 1925, for a dissertation written under Franz Oppenheimer. During his time in Frankfurt he married Luise Schuster (1893–1975), born Lotter, on 11 December 1923. After his graduation they moved to Fürth and he became executive in his parents' company in 1925. After three years he became assistant at the Institut für Wirtschaftsbeobachtung der deutschen Fertigware, a marketing research institute founded by Wilhelm Rudolf Mann and de:Wilhelm Vershofen. Later, he became deputy director of the institute. During World War II, he worked on concepts for a postwar peace; however, officially such studies were forbidden by the Nazis, who had declared total war. As a result, Erhard lost his job in 1942 but continued to work on the subject by order of the "Reichsgruppe Industrie." In 1944 he wrote War Finances and Debt Consolidation (orig: Kriegsfinanzierung und Schuldenkonsolidierung). In this study he assumed that Germany had already lost the war. He sent his thoughts to Carl Friedrich Goerdeler, a central figure in the German resistance to Nazism, who recommended Erhard to his comrades. Erhard also discussed his concept with Otto Ohlendorf, deputy secretary of state in the Reichsministerium für Wirtschaft. Ohlendorf himself spoke out for "active and courageous entrepreneurship (aktives und wagemutiges Unternehmertum)", which was intended to replace bureaucratic state planning of the economy after the war. Erhard was an outsider who completely rejected Nazism, supported resistance, and endorsed efforts to produce a sensitive, intelligent approach to economic revival during the postwar period. After the war Erhard became an economic consultant. Under the Bizone established by the American and British administration in 1947, he led the Sonderstelle Geld und Kredit (Special Office for Money and Credit), an expert commission preparing the currency reform in Germany's western zones of occupation. The commission began its deliberations in October 1947, and in April 1948 produced the so-called Homburg plan, elements of which were adopted by the Allies in the currency reform that set the stage for the recovery of the economy. In April 1948, Erhard was elected director of economics by the Bizonal Economic Council. On 20 June 1948, the Deutsche Mark was introduced. Erhard abolished the price-fixing and production controls that had been enacted by the military administration. This exceeded his authority, but he succeeded with this step. In the first free elections following the Nazi era, Erhard stood for election in a Baden-Württemberg district and was elected. He was appointed Minister for Economic Affairs, a position he would hold for the next 14 years; from 1957 to 1963 he was also the 2nd Vice-Chancellor of Germany. A staunch believer in economic liberalism, Erhard joined the Mont Pelerin Society in 1950 and used this influential body of liberal economic and political thinkers to test his ideas for the reorganization of the West German economy. Some of the society's members were members of the Allied High Commission and Erhard was able to make his case directly to them. The Mont Pélerin Society welcomed Erhard because this gave its members a welcome opportunity to have their ideas tested in real life. Late in the 1950s, Erhard's ministry became involved in the struggle within the society between the European and the Anglo-American factions, and sided with the former. Erhard viewed the market itself as social and supported only a minimum of welfare legislation. However Erhard suffered a series of decisive defeats in his effort to create a free, competitive economy in 1957; he had to compromise on such key issues as the anti-cartel legislation. Thereafter, the West German economy evolved into a conventional welfare state from the basis that had been already laid in the 1880s by Bismarck. According to Alfred Mierzejewski the generally accepted view is that Germany has a social market economy, that the post-war German economy has evolved since 1948, but the fundamental characteristics of that economic system have not changed, while in his opinion the social market economy had begun to fade in 1957, disappearing entirely by the late 1960s. In July 1948, a group of southwest German businessmen had attacked the restrictive credit policy of Erhard as Economic Director. While Erhard had designed this policy to assure currency stability and stimulate the economy via consumption, business feared the scarcity of investment capital would retard economic recovery. Erhard was also deeply critical of a bureaucratic-institutional integration of Europe on the model of the European Coal and Steel Community. Erhard decided, as economic director for the British and American occupation zones, to lift many price controls in 1948, despite opposition from both the social democratic opposition and Allied authorities. Erhard's financial and economic policies soon proved widely popular as the German economy made a miracle recovery to rapid growth and widespread prosperity in the 1950s, overcoming wartime destruction and successfully integrating millions of refugees from the east. After the resignation of Adenauer in 1963, Erhard was elected chancellor with 279 against 180 votes in the Bundestag on 16 October. In 1965, he was re-elected. From 1966 to 1967, he also headed the Christian Democratic Union as de facto chairman, despite the fact that he was never a member of that party (which made his election to the chairmanship irregular and void de jure), as he never formally filed a membership application despite pressures from Chancellor Adenauer. The reasons for Erhard's reluctance are unknown, but it is probable that they stemmed from Erhard's general scepticism about party politics. However, Erhard was regarded and treated as a long-time CDU member and as the party chairman by almost everyone in Germany at the time, including the vast majority of the CDU itself. The fact that he was not a member was known only to a very small circle of party leaders at the time, and it did not become known to the public until the year 2007, when the silence was finally broken by Erhard's close advisor Horst Wünsche. Domestically, a number of progressive reforms were carried out during Erhard's time as chancellor. In education, the number of years of compulsory education was extended, spending on schools was significantly increased, and a standardisation of the school system among the Länder (Hamburg Agreement) was carried out. In the field of social security, Housing Benefit was introduced in 1965, while federally funded child allowances for two or more children were introduced a year earlier. Erhard considered using money to bring about the reunification of Germany. Despite Washington's reluctance, Erhard envisaged offering Nikita Khrushchev, the leader in Moscow, massive economic aid in exchange for more political liberty in East Germany and eventually for reunification. Erhard believed that if West Germany were to offer a "loan" worth $25 billion US to the Soviet Union (which Erhard did not expect to be repaid), then the Soviet Union would permit German reunification. The acting American Secretary of State George Wildman Ball described Erhard's plan to essentially buy East Germany from the Soviet Union as "half-baked and unrealistic." Erhard's objective corresponded in time with Khrushchev rethinking his relations to West Germany. The Soviet leader secretly encouraged Erhard to present a realistic proposal for a 'modus vivendi' and officially accepted the chancellor's invitation to visit Bonn. However, Khrushchev fell from power in October 1964, and nothing developed. Perhaps more importantly, by late 1964, the Soviet Union had received a vast series of loans from the international money markets, and no longer felt the need for Erhard's money. Erhard believed the major world problems were solvable through free trade and the economic unity of Europe (as a prerequisite for political unification); he alienated French president Charles de Gaulle, who wanted the opposite. Support for the American role in the Vietnam War proved fatal for Erhard's coalition. Through his endorsement of the American goal of military victory in Vietnam, Erhard sought closer collaboration with Washington and less with Paris. Erhard's policy complicated Allied initiatives toward German unification, a dilemma that the United States placed on the back burner as it focused on Southeast Asia. Erhard failed to understand that American global interests—not Europe's needs—dictated policy in Washington, D.C., and he rejected Adenauer's policy of fostering good relations with both the United States and France in the pursuit of West German national interest. Faced with a dangerous budget deficit in the 1966–1967 recession, Erhard fell from office in part because of concessions that he made during a visit to U.S. President Lyndon B. Johnson. In 1961, while vice president, Johnson had hosted Konrad Adenauer some two years before the German statesman vacated the chancellorship of the German Federal Republic. In December 1963, less than a month after he had assumed the American presidency upon the assassination of John F. Kennedy, Johnson staged the first ever presidential barbecue in Erhard's honor. The event was held in and about the Stonewall Elementary School gymnasium in Stonewall in the Texas Hill Country. Among the entertainers was the internationally known concert pianist Van Cliburn, who appeared in a business suit, rather than his usual formal wear. As a member of the Texas House of Representatives, Samuel Ealy Johnson, Jr., Johnson's father, been sensitive to his German-American constituency and had opposed the Creel Committee's attempt to disparage German culture and isolate German-Americans during World War I. Adenauer and Erhard had also stayed at Johnson's ranch in Gillespie County. Erhard's fall suggested that progress on German unification required a broader approach and a more active foreign policy. Chancellor Willy Brandt in the late 1960s abandoned the Hallstein Doctrine of previous chancellors and employed a new "Ostpolitik," seeking improved relations with the Soviet Union and Eastern Europe and thereby laying the groundwork for détente and coexistence between East and West. In the 1980s Chancellor Helmut Kohl, however, reverted to Erhard's approach in collaborating with the Reagan administration in its hard-line anti-Soviet policy. On 26 October 1966, Minister Walter Scheel (FDP) resigned, protesting against the budget released the day before. The other ministers who were members of the FDP followed his example — the coalition was broken. On 1 December, Erhard resigned. His successor was Kurt Georg Kiesinger (CDU), who formed a grand coalition with the SPD. Erhard continued his political work by remaining a member of the West German parliament until his death in Bonn from heart failure on 5 May 1977. He was buried in Gmund, near the Tegernsee. The Ludwig Erhard-Berufsschule (professional college) in Paderborn, Fürth and Münster are named in his honour. The term of Erhard's first ministry was from 16 October 1963 to 26 October 1965. 16 June 1964 – Ludger Westrick (CDU) succeeds Krone as Minister of Special Tasks. 1 April 1965 – Karl Weber (CDU) succeeds Bucher as Minister of Justice. Following his re-election on 26 October 1965, Erhard's second ministry ran until his resignation on 1 December 1966. 28 October 1966 – Hans-Christoph Seebohm (CDU) succeeds Mende as Vice Chancellor, remaining also Minister of Transport. Johann Baptist Gradl (CDU) succeeds Mende as Minister of All-German Affairs. The other FDP ministers, Dahlgrün and Scheel, also resign. 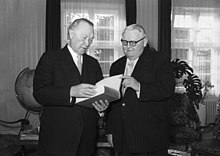 8 November 1966 – Kurt Schmücker succeeds Dahlgrün as Minister of Finance. Werner Dollinger (CSU) succeeds Scheel as Minister of Economic Cooperation, remaining also Minister of Federal Treasure. Berwid-Buquoy, Jan: Der Vater des deutschen Wirtschaftswunders – Ludwig Erhard. BI-HI-Verlag, Berlin 2004, ISBN 3-924933-06-5. Karl Hohmann: Ludwig Erhard (1897–1977). Eine Biographie. Bonn 1997 (PDF-Datei, ca. 3 MB). Hoeres, Peter: Außenpolitik und Öffentlichkeit. Massenmedien, Meinungsforschung und Arkanpolitik in den deutsch-amerikanischen Beziehungen von Erhard bis Brandt. De Gruyter Oldenbourg, München 2013 (Studien zur Internationalen Geschichte, Bd. 32). Mierzejewski, Alfred C.: Ludwig Erhard. Siedler, München 2005, ISBN 3-88680-823-8. Roth, Karl Heinz: Das Ende eines Mythos. Ludwig Erhard und der Übergang der deutschen Wirtschaft von der Annexions- zur Nachkriegsplanung (1939 bis 1945). 1. 1939 bis 1943. In: 1999. Zeitschrift für Sozialgeschichte des 20. und 21. Jahrhunderts 10, 1995, Nr. 4, ISSN 0930-9977, S. 53–93. Roth, Karl Heinz: Das Ende eines Mythos. Ludwig Erhard und der Übergang der deutschen Wirtschaft von der Annexions- zur Nachkriegsplanung (1939 bis 1945). II. 1943 bis 1945. In: 1999. Zeitschrift für Sozialgeschichte des 20. und 21. Jahrhunderts 13, 1998, Nr. 1, ISSN 0930-9977, S. 92–124. Löffler, Bernhard: Ludwig Erhard. In: Katharina Weigand (Hrsg. ): Große Gestalten der bayerischen Geschichte. Herbert Utz Verlag, München 2011, ISBN 978-3-8316-0949-9. What's the good word on Ludwig Erhard?